A large part of the charm of Portland, Oregon lies in its architecture, an intriguing cross-section of styles that span the city’s colourful history. That coupled with a willingness by its developers and entrepreneurs to integrate building and business has meant that this bijou north-west nook practically bristles with interesting set-pieces for boutiques, restaurants and especially hotels. 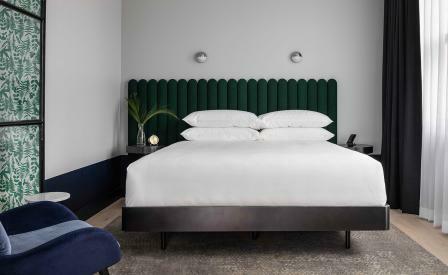 The new Woodlark hotel in downtown Portland is an architectural mix of two adjoining National Historic Register buildings – the 1912 Woodlark Building and the 1908 Cornelius Hotel – which LA-based R&A Architecture & Design, local studio Oculus Inc (formerly Staicoff Design), and Atlanta-based Smith Hanes have artfully fused into a slick 150-room hotel. The handsome bones of both buildings have been repointed and reinforced, right up to the metal mansard roofs, while the interiors shine with brass inlays, black lacquer and hand-blown glass lights, alongside grey timber floors, 10ft-long leather sofas, and steel and wood spiral staircases in the 20ft-high loft suites on the third storey.